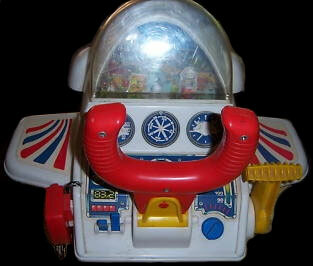 Description: Little pilots will feel like a real pilot when "driving" their very own Fun Flier. The Fun Flier is a motorized battery-operated mini-airplane (simulated plane) with a movable scenery that makes children feel as though they are fling high above the ground. Requires 4 C-size batteries (not included). Designed for children ages 3 to 7 years old. FPT19271 - White motorized battery operated mini-airplane that has working yellow propellers on the front and movable control dials and gauges and switches on the control panel. The control panel has a red pretend CB attached via black coiled cord and a red handle to "drive" the plane. The control panel also has a clear plastic window with revolving scenery. Children use the handle to move a tiny model airplane around within the window over the scenery. There are even obstructions that pop up for a more challenging flight. FP2310BOX1988 - (BOX ONLY) - Sold in a 16-1/2" long, 15-3/8" high, 10-1/2" deep box. FP2310SET1988 - (COMPLETE SET) - Complete set in original 16-1/2" long, 15-3/8" high, 10-1/2" deep box.